Tagines are a great favorite in Morocco. These flavorful, stew-like dishes can be made from almost any meat, fish, or vegetable you can think of. Our recipe features kefta, a ground meat that’s flavored with aromatics (like onion) and spices (like cumin). Think of it as hamburger on steroids. We form the kefta into little meatballs, then cook them in a savory tomato sauce that’s spiced with fragrant cinnamon and other goodies. Tagine derives its name from the traditional pot in which it is cooked. A tagine (also spelled tajine) pot is an earthenware cooking vessel that comes in two pieces: a shallow base that sits over a burner or stove top, and a conical lid that helps return condensation to whatever is cooking in the bottom. But you don’t need a tagine pot to make this dish. A Dutch oven or deep frying pan works equally well. In Morocco, every butcher has his own recipe for kefta (also spelled keefta, kifta, kofta—and other ways I’m probably not even aware of). You’re not likely to find kefta in any US supermarket, so you’ll have to mix your own. But that’s easy to do, especially if you have a food processor. This is the first dish I learned to make when I lived in Morocco years ago. I took a cooking class, and this recipe is adapted from the one I learned there. I’ve subsequently seen nearly identical recipes in several cookbooks that have been published over the years. It’s traditional to top this dish with poached eggs, though you can omit them if you want. When I was in Morocco, this dish was served by bringing the cooking vessel to the table. Everyone would eat communally with their right hands, using pieces of bread to scoop up the sauce and kefta meatballs. These days, I often serve this dish with rice, or over a bed of mashed potatoes. I also like to serve it over Couscous with Dried Fruit. Preparing this dish requires a few steps—none of them difficult. You need to mix the kefta, shape it into meatballs, and brown them. Then you need to prepare the tomato sauce (the browned kefta meatballs will finish cooking in it). Prep time for this dish is 30 minutes or so, and cooking time is about an hour (much of it unattended). This recipe serves 6. Leftovers keep well for a few days in the refrigerator if stored in an airtight container. Or you can freeze them. Peel the onion and chop it roughly if using a food processor (or grate it finely if mixing kefta by hand). Wash and dry the cilantro and parsley, and chop it roughly (or mince well if mixing kefta by hand). If using a food processor: Place the onion, cilantro, and parsley in the bowl and pulse until finely chopped. Add the ground beef or lamb, along with the cumin, cayenne pepper, and salt. Pulse until the onion, herbs, and spices are well incorporated into the ground meat. If mixing kefta by hand: Place all the ingredients (except the oil) in a medium-sized bowl. Using a spoon (or your hands), mix until everything is well incorporated. Wet your hands and pick up a small amount of the meat mixture. Roll between your palms until you’ve formed a meatball that’s about an inch in diameter. Repeat until you’ve formed all the kefta into balls. Place a large frying pan, preferably nonstick, on medium heat. When heated, add the oil. Once the oil is hot (it’ll shimmer—this takes about 15 seconds), add the kefta meatballs. Brown the meatballs on all sides, then set them aside while you continue with the sauce (you can brown the meatballs a few hours ahead of time if you wish; just refrigerate them in an airtight container until you’re ready to proceed). Peel the onions and chop them into dice of ½ inch or less. Peel the garlic cloves and mince them finely. Place a large, deep skillet or Dutch oven on the stovetop and turn the heat to medium. When the skillet is heated, add the oil. Once the oil is hot (it’ll shimmer—this takes about 15 seconds), add the chopped onion and garlic. Season with salt. Sauté for 5 minutes, or until the onion is just starting to become translucent. Meanwhile, wash and chop the cilantro and parsley. Add the cilantro, parsley, canned tomatoes, cumin, black pepper, cinnamon, and cayenne to the onions and garlic. Stir to combine. Bring the mixture to a simmer, then set a timer for 15 minutes. 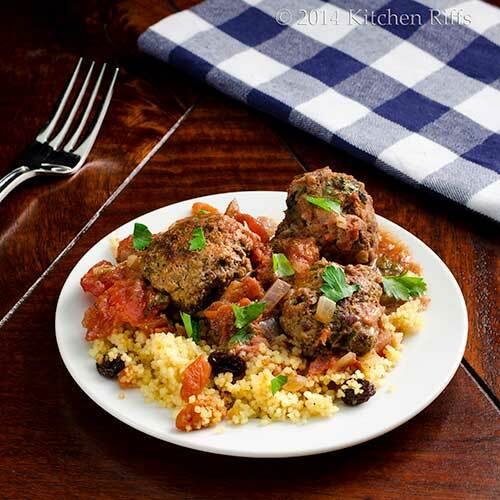 At the 15-minute mark, add the kefta meatballs that you prepared previously. Set the timer for another 15 minutes. Meanwhile, if you’re using eggs: Break each egg into a small individual bowl. When the timer goes off again, check the consistency of the sauce (you want it to be thick and jam-like; if it’s not thick enough, allow it to continue cooking for a few minutes). Once the sauce has cooked down to the proper consistency, add the eggs (if using). Carefully slip each egg from its bowl into the simmering sauce, spacing the eggs evenly around the perimeter of the cooking vessel. Poach the eggs in the sauce until they’re done to your liking—at least 4 minutes. The yolks will be quite runny at the 4-minute mark; if you want them to be firmer, cook the eggs for another minute or two. Scatter some minced cilantro and/or parsley over the top of the dish. Bring the cooking vessel to the table and serve from it (see Notes). In Morocco, this dish often is made with lamb—though beef is also quite common. In US supermarkets, it’s usually easier to purchase ground beef, so that’s what I use. BTW, I like ground chuck in this dish, but any grade of ground beef will work. Don’t be afraid to change the quantities of cilantro, parsley, onion, garlic, or spices in this recipe. Every butcher mixes his kefta differently, and every cook prepares the tomato sauce a bit differently. This recipe reflects the way I make the dish; you may prefer different ingredient ratios. You may also prefer to skip the cilantro entirely and use more parsley (or vice versa). You can substitute a neutral oil like canola for olive oil in this dish if you like. If you don't have Kosher salt on hand, you can use plain table salt. In that case, though, I’d reduce the amount by about half since table salt is finer and more “condensed” than Kosher. Eggs carry a slight (but real) risk of salmonella. So I suggest using pasteurized whenever the eggs won’t be fully cooked (and in my book, if the yolk is runny, they’re not fully cooked). Although it’s unlikely that the eggs you buy will be infected, why take the risk? You can usually identify pasteurized eggs because they have a red “P” stamped on them. When I make this dish, I often prepare the eggs ahead of time using the method described in our recipe for Poached Eggs. I fully poach and chill the eggs, then just slip them into the hot tomato sauce to warm for a few minutes before serving. Although the recipe instructs you to bring the cooking vessel to the table for serving, I often don’t. Instead, I tend to plate in the kitchen. When I do that, I generally reheat the poached eggs in hot water (again, see our prior post on Poached Eggs). To serve, I add the Kefta and sauce to a plate (along with couscous or another starch), then top it with the poached egg, and sprinkle on some chopped parsley or cilantro for garnish. Though the poached egg looks pretty (and adds flavor), I often omit it. This dish is filling enough without it. “Next time we should make some Moroccan bread to go with it,” I said. “Yeah, maybe I should make that salad again,” I said. “Or maybe we should go to Morocco!” said Mrs K R.
Think I know which option I’ll go for. I'm actually going to a Moroccan place tonight for dinner! Never thought to make this at home, so I commend you! Hi Shikha, isn't this a great dish? Although because I make this at home, when I go to a Moroccan restaurant I always order something more exotic! Thanks for the comment. What a beautiful, colorful dish. My boys and I are all couscous lovers so this will give me a good excuse to make some. Great flavor combinations and something just a little bit different to the cold winter nights. This kefta looks devine! Thanks, once again, for the inspiration! Hi Karen, couscous works so well with this! I think you'll enjoy the tagine. ;-) Thanks for the comment. Hi Dan, it's really good! I love the flavor of this - such interesting spices. Thanks for the comment. Looks like something we'd like to eat! Love the colors :) Thanks for sharing! Hi Lydia, isn't this nice? And the colors are so fun (particularly with the poached egg). Thanks for the comment. Keefta, kofta? What does it matter? It's all good! These look great and who doesn't like little meatballs in a tomato sauce with a luscious fried egg? This is a WINNER! I'm not sure what the prize is, but a winner none the less! And I'm with Mrs. KR. Go to Morocco! Delicious tagine with beef and the pictures are pleasing to the eyes too !!! Love it. I like to use 1/2 beef and 1/2 lamb, grinding the lamb myself in the food processor if I have to. Hi John , what a beautiful dish , I just told my family , they will have a treat for dinner Sunday ,I will serve it with the poached eggs , my kids looked at the dish and said mama he sure can cook :-D . Love the combination of ingredients , only use kosher salt and pasteurized eggs , as I look at this dish all I think of is yum yum , thanks for sharing ...."tahzheen"
This does indeed look wonderful, John. I can almost smell its spiciness from here! Sounds so good and full of flavor. I love the combination of spices, so unusual (at least for us). The egg sounds like it would be so good with it too. Speaking of herbs, I really want to get one of those aerogardens to have fresh parsley year round. Hi Abbe, this one really is a winner. Definitely worth making. And cheaper than a trip to Morocco. ;-) Thanks for the comment. Hi Honey, tah-zheen is a slightly more authentic pronunciation, buy they're all good And this is one delish dish. ;-) Thanks for the comment. Hi Shibi, it's a wonderful dish! Very comforting. ;-) Thanks for the comment. Hi Karen, this is so worth trying! I think you'd really like it. Thanks for the comment. Hi Arthur, it's a wonderful dish! Thanks for the comment. HI Seth, always nice to hit a homer! ;-) Thanks for the comment. Looks great my dear. In Egypt we call it " Koftet Dawood Pasha" ... or Dawood Pasha kefta :) it is very moist and kid friendly recipe. Thanks for sharing the Moroccan version. Hi FJK, I've done the 1/2 and 1/2 thing too - you're right that it's so good. And I also sometimes grind the meat myself - although usually I get lazy and buy it already ground. Thanks for the comment. Hi Nee, your kids are so sweet! You'll all love this one, trust me. ;-) Thanks for the comment. Hi Lizzy, it's a wonderful dish! And even though it's a nice winter dish, the first time I made it was in 95 degree F summer heat in Morocco. So you have no excuses! ;-) Thanks for the comment. Hi Chris, it's the spice combos that I find particularly interesting about Moroccan cooking. By and large the food isn't spicy "hot" but just full of flavor. Thanks for the comment. Hi Dawn, those aerogardens really look pretty neat, don't they? I'm really really tempted - just need to figure out where to put it! Thanks for the comment. Hi Amira, isn't this a great dish? 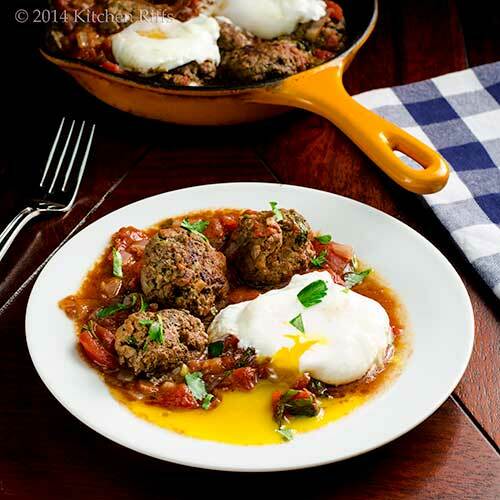 Paula Wolfert has virtually the identical recipe in one of her books, and she calls it Kefta Mkaouara. Whatever one calls it, it's wonderful! Thanks for the comment. I want this for dinner! I love Kefta and this recipes sounds tasty. Hi Greg, isn't kefta such good stuff? I love it! Thanks for the comment. Hi Paula, pretty hard to resist a trip to Morocco. ;-) This is a great dish - worth making sometime. Thanks for the comment. Wow! What a delicious looking plate! Love the flavors in the meatballs and cinnamon in tomato sauce sounds fantastic! Thanks for the wonderfully exotic recipe, John! Hi Bill, this really is a super dish. The flavors are totally enticing - I think you'd like them. ;-) Thanks for the comment. Hi Denise, isn't this a fun dish? Looks good, tastes better! ;-) Thanks for the comment. Today I pulled everything of my freezer and low and behold I found a pound of ground lamb that I had forgotten about. Now I see this. Must be a sign. I haven't made anything with meatballs since last winter. 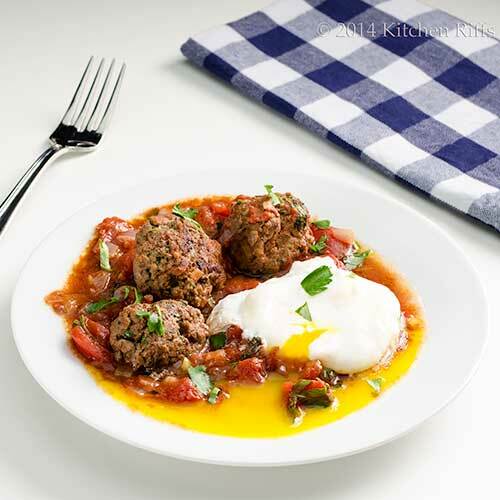 Your kefta looks delicious with the tomato sauce and then that egg - well, what can I say. What a delicious looking dish John!! Awesome flavors! Yum, Yum and more yum. That looks wonderful I could go some kefta right now. Will definitely be trying this recipe out John got all the ingredients I need in the fridge - maybe it was meant to be. did I mention - yum! A beautifully fragrant and extremely mouthwatering dish! I'd love to sit at your table. I always enjoy the teaching style of your posts, especially when it is something I've not had the pleasure of trying before. I've not eaten much Moroccan cuisine, but this recipe inspires me to change that. Yum! Love the combination of flavors and textures in this dish. It looks and sounds stunning! You must have so many stories from your stay in Morocco - and so many dishes! Even though I lived in Abu Dhabi, I never heard of kefta before - they sound so good with all those spices and the poached egg! Hi MJ, that definitely sounds like a sign to me! ;-) I need to pull everything out of my freezer too - I know I have buried treasure in there! Thanks for the comment. Hi Lizzie, it's definitely meant to be! I mean, it's yummy. ;-) Thanks for the comment. Hi Rosa, it's a good dish - extremely tasty. And I'd love having your at our table! Thanks for the comment. Hi Judy, the best thing about Moroccan food is the fun spice combos. It's there that I learned how great cinnamon can be in savory dishes. Thanks for the comment. Hi Daniela, isn't this a nice dish? And incredibly flavorful - one of my faves! Thanks for the comment. Hi Shashi, I'm surprised there wasn't something kefta-like in Abu Dhabi. Interesting how foods travel (or not). Anyway, you'd definitely enjoy this - it's a great dish. Thanks for the comment. How cool that you lived in Morocco! This dish looks wonderful - I love all the different colors. Hi Laura, that was a fun experience! And I learned so many great recipes. ;-) Thanks for the comment. Hi Louise, the egg is awfully pretty, but it's a bit too much. Unless one is famished, of course. ;-) I probably should do a Mint Tea post someday. Problem is, made correctly it's incredibly sweet! It'll make your teeth ache. ;-) Thanks for the comment. This sounds wonderful John. I think I'd like to try it with lamb although my husband would probably prefer beef. It sounds similar to spaghetti and meatballs only omitting the pasta and using another form of starch. Really nice recipe. I'll have to pull out my Tagine and try this soon. I've never been to Morocco but would love to go sometime. Our Indian version of this is kofta curry, eaten the same way - use roti or naan to scoop the gravy. Of course the prep and recipe differs. These Morrocon keftas have won my heart,look fabulous. Hi VIcki, this recipe is great with lamb! Although beef works really well too. This is a lot like spaghetti and meat balls - just different flavoring. ;-) Thanks for the comment. Hi Minnie, I've had kofta curry - really delish stuff. I don't believe I've ever cooked that, though - I should. Thanks for the comment. This meal looks incredible. It's 6:30 am and my mouth is watering! I loved the poached egg. Adds beautiful color! Hi Candy, this dish really has terrific flavor! Thanks for the comment. Hi Kristi, that egg really does look nice, doesn't it? Thanks for the comment. I can just imagine how warming and comforting this dish is! I am enjoying middle eastern flavors more all the time, so this will be something I will try very soon - thanks John! John, I love lamb, and Moroccan lamb recipes are some of my most favorite. I used to make Moroccan leg of lamb for special occasions - so delicious! Love kefta too - your colorful photos are making me hungry! Tagine looks fantastic John! If you happen to have a Middle Eastern butcher close by, I bet they'll have a kefta mix. My store here does but I don't buy it just because I prefer my meat leaner than what they use. I also like to change up my spices. 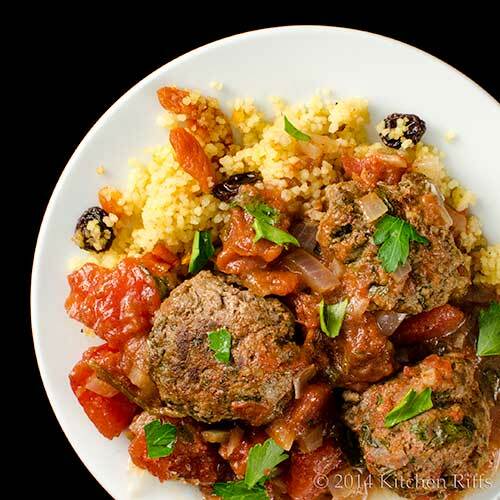 This kefta tagine is delicious, I make it often but mine has cinnamon and all spice too. Yours looks so good and would go great with some couscous. Thanks! Hi Donalyn, it's a great dish, and I agree the sort of flavors that are in this dish are so interesting. Thanks for the comment. Hi Julia, lamb is my favorite red meat! And I do prefer kefta made with lamb - but beef is darn good, too. Thanks for the comment. Hi Nazneen, I have seen kefta at Middle Eastern butchers. But like you, I prefer my own - I can balance the flavors that way. I often use all spice in my kefta, too, and sometimes cinnamon. Changing up spices is a good thing! Thanks for the comment. We have not had moroccan in ages! Love this dish! Wow, this looks SO good! My sister just became a vegetarian, so she won't want this. But more for me! So I've been pronouncing tagine wrong for years??? No matter what it's called, it looks amazing!!! Exotic, beautiful and tasty! Sarah & Arkadi, probably time for you to have some Moroccan soon! ;-) Thanks for the comment. Hi Cathleen, more for you is a good thing, yes? ;-) Thanks for the comment. Hi Liz, most Americans - me included! - can't really pronounce "tagine" the way a Moroccan would. Arabic has sounds that just don't exist in English. If we understand each other, all is good. ;-) Thanks for the comment. Mmmmm... more Moroccan deliciousness! These meatballs look great and so flavorful! Great recipe! Hi Amy, those kefta meatballs are really tasty! :-) Thanks for the comment. That looks totally delicious John! I didn't know you lived in morocco for a while. I've only visited once but really loved the food! some of the dishes can be found in other Mediterranean countries around here with slightly different flavors but this looks great! Hi Simone, it's a really tasty dish! I'd love to get back to Morocco some time - totally agree the food is wonderful! Thanks for the comment. I've had lamb in prune tagine quite a few times at Moroccan restaurants here but I have never made the dish. I have been wanting to serve this at home for a while but never got around to do it. Your version looks just amazing and I would love to try the tomato tagine! Will definitely make this soon. Thanks for sharing! Hi Yi, meat and fruit tagines are pretty popular in Morocco - and really good! I know a few recipes, and should make one. But this one is terrific, and really easy to make. Thanks for the comment. I will take kefta over a hamburger any day. I had never seen it with the poach egg, but it must add so much creaminess and flavor to the dish. Great recipe! Hi VIcky and Ruth, when I lived in Morocco I had many a kefta burger. Good, but for that application ground meat without the added seasoning is better, I think. But I agree kefta has wonderful flavor - it's good all by itself. Thanks for the comment. Hi Bam, this is such a nice dish! Your hungry teenagers would be all over it. ;-) Thanks for the comment. I love Moroccan cuisine and your dish looks very tempting; its not just healthy but so delicious too. Hi Amanda, I so know what you mean about being hungry close to dinner time! Thanks for the comment. Hi easyfoodsmith, this really is a great dish -- loads of flavor. Thanks for the comment. I have never eaten Moroccan cuisine before. But I am sure that I would love this, it sounds delicious. Hi Dawn, Moroccan chow is really good! I love their spices. Thanks for the comment. I am pinning this one for winter! YUM! Hi Julie, just as cook in summer as in winter, although I agree it looks more like a winter dish. Thanks for the comment. Unfortunately I'm not so familiar with Moroccan cuisine - such a shame living in the Bay Area (where we have good Moroccan restaurants) - and this looks really good too. I'm missing out for sure!! Hi Nami, it's definitely worth it to try a Moroccan restaurant sometime. I love their food! Thanks for the comment. Hi Kiran, isn't this nice? You definitely need to make yourself a tagine! Thanks for the comment. Hi Terra, I'll bet venison would be wonderful in this recipe! I love the idea! Thanks for the comment. Hi Maureen, isn't this a great recipe? Tons of flavor, and so satisfying! One of my favorite dishes. Thanks for the comment. I love tagines - and most stews. This is where the beauty and purpose of slow-cooking shines through, in balanced, nuanced flavours! Hi Kitchen Butterfly, tagines and stews are terrific! Particularly in the cold weather we're having in much of the US. Thanks for the comments. Its a great recipe. Can I try myself? Hi KGReciPes, it is a great recipe, isn't it? It's a pretty easy recipe, so I would think you'd be able to make this at home. Thanks for the comment. Hi Home Recipes, it is! Thanks for the comment. Perfect John! Meatball Day will never be the same after we're done feasting our way through it!!! If I didn't say it before, I'm saying it now, John, these meatballs look dee...li...cious! Thanks for joining us for Meatball Day!